All Spinones, All The Time. 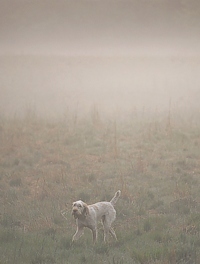 This AKC hunt test was run as part of the national club's spring specialty show in Hustle, VA.
Well before the first run of the day, and before the sun had cooked off the morning fog, this pair gets in a peaceful stroll. 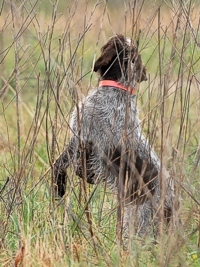 A little conversation on the retrieve. Hunting through some dewy cover. â€¦ and breaking away from the line. 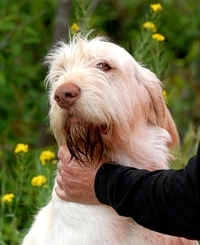 A relaxed handler lets her Spinone work in that relaxing Spinone way. A brace converges on the bird field. 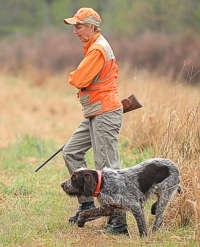 A pair makes a comfortable pace in the Senior bird field. 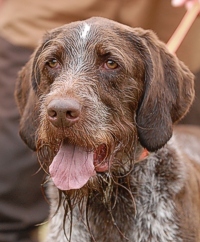 This dog was sent on a challenging blind retrieve from behind a hedgerow. As he hunts dead, he stops to get his nose as high as possible, searching the breeze for a bit of the downed bird's scent. 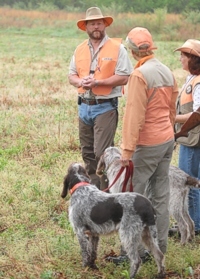 Only breeching shotguns (side-by-sides or over/unders) are used by gunners at AKC hunt tests. 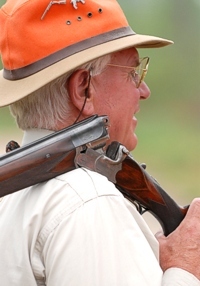 Whether up close in conversation, or at 100 yards, all can see when a gun is breeched and safe. This gentleman's well-used over/under shows as much character as its owner. 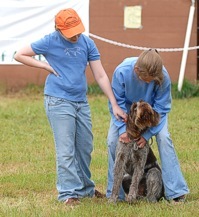 Judges, handlers, and a brace of Junior Hunter dogs watch for the field to clear before heading out. It's not uncommon to see a bell hanging from the collar. 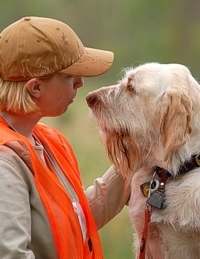 It helps the handler locate a dog working in dense cover, and when it suddenly stops ringing, there's usually a point to consider. 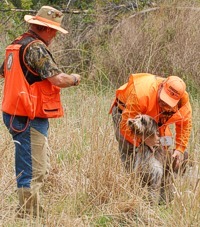 At the judges' discretion, a handler might be asked to grab and throw a non-flying (say, wet) bird for a flush. Alas, sometimes it's harder for the dog to stay steady once he's seen his master handle the bird. Even a bit winded and back on the lead, he's entirely focused on his bracemate's activities. During a break in the testing action, the Spinone Olympics included several mysterious events, including this crop-circle-ish activity, set to music. Not every participant was willing to sit quickly in his or her rope circle when the music stopped. And we have a winner, it seems. By a nose. This guy has a two-woman pit crew helping him keep his cool before the treacherous Hot Dog Retrieving event. Only 18 months old! Perhaps his name should be 'Placido'? Such a thoughtful fellow, amidst all of the event excitement. The Spinone Club of America definitely gets credit for having a classy seal, and it's seen on many a vest and jacket during the events. Two youngsters, acting quite Junior-ish, break away for the run on the Junior Hunter course. 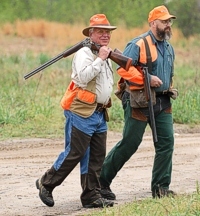 In hot pursuit of one Mr. Bob White. The run is over, and it's a chance to thank the judge as he writes up his scores. Done with bringing down birds for the Senior and Master tests earlier in the morning, a gunner sets out on the Junior course with his own dog. Another peaceful moment waiting for a go at the Junior course. Good boy, Roman - you're next. Things on the Junior course aren't usually quite as â€¦ methodical. Working hard to turn up one of the few Junior field birds that hadn't coveyed up to the hedgerow. Roman working into the wind.